Figure 1: The relative sizes of a globular protein and the mRNA that codes for it. The myoglobin protein is drawn to scale next to the mRNA transcript that leads to it. The coding sequence of an mRNA alone is about an order of magnitude heavier by mass than the protein. 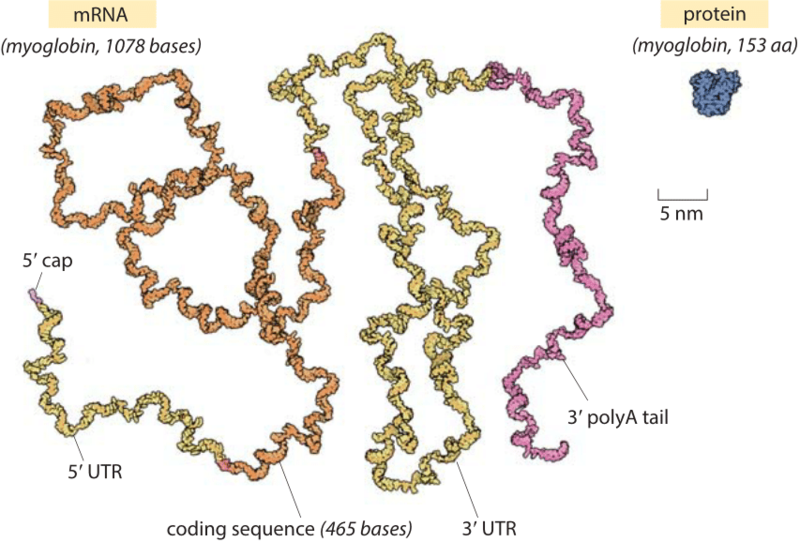 The myoglobin protein is in blue, the 5’ cap and 3’ polyA tail are in purple, the 5’ and 3’ untranslated regions (UTRs) are in yellow and the coding sequence is in orange. Illustration by David Goodsell.